You’re not surprised I made another gooey bar, are you? No? Good. Because this lemon version is my favorite gooey bar EVER. 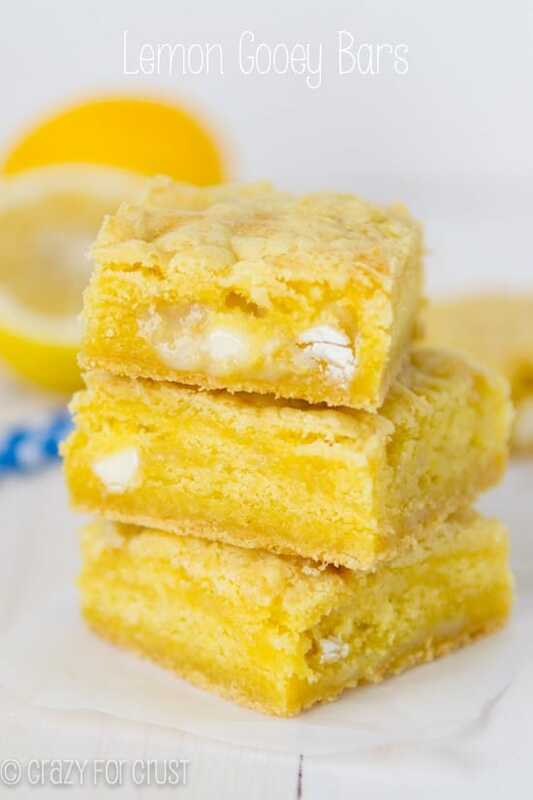 Lemon Gooey Bars – this EASY cake mix recipe uses lemon cake mix to form the bar that’s filled with a gooey white chocolate filling! EVERYONE loves these! Hi, my name is Dorothy and I have a gooey bar addiction. 1. They’re so easy to make. Cake mix, butter, egg, and sweetened condensed milk. DONE. 2. They’re infallible. Pretty much you can’t mess these up, I promise. 3. They taste amazing. Like cake…but gooey and bar-like. 4. There are so many different flavor combos it’s mind boggling. 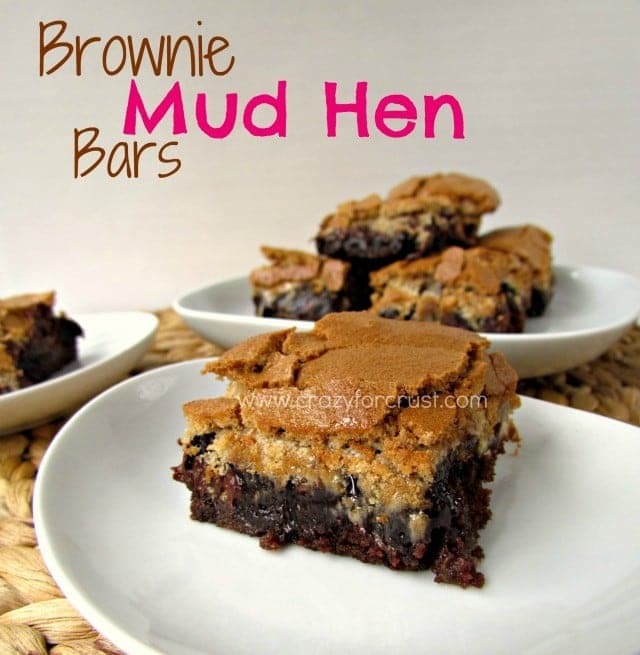 Maybe I should change my name to Crazy for Gooey Bars. Right now? I’m crazy for lemon gooey bars. I first made these last June for my sister-in-law’s birthday. She looooooves lemon. I always make her some sort of lemon dessert for holidays and celebrations. I broke the food blogger cardinal rule last June when I made them: I didn’t photograph them. It was a last minute bake and there was no time to cut and take pictures. I figured it was time to share! Okay, so let’s rundown the gooey bar in case you’ve never made them. Cake mix + egg + butter forms a thick dough. Don’t use the box directions. Just use the cake mix powder and follow my directions. Press about 2/3 of the batter into a pan. You don’t have to use foil, but I highly recommend it for this recipe. Sweetened condensed milk is sticky. Spray it well with cooking spray. Add whatever mix-ins you like. White chocolate + lemon is amazing, but coconut would also be fab in these. You break up the remaining chunks of dough and place it on top of the bars. I like to break off about 1/2-1 tablespoon size pieces and drop them over the top, then lightly press with my hands. Some of the SCM will show through. Once they’re baked, cool and chill to set, then cut into bars. These freeze well, as long as they are in a single layer. They’ll stick to each other and whatever you put in between the layers. But if you have any left to freeze I kind of don’t understand you. How is that even possible? Are you related to my husband? These are my favorite gooey bars yet. Lemon goodness, people! 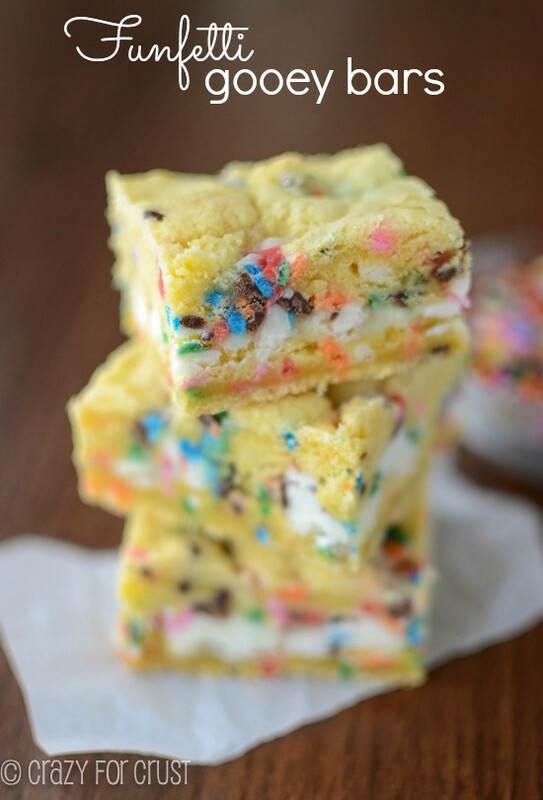 If you love gooey bars, be sure to check out all my favorites here, especially my funfetti gooey bars and chocolate chip cookie gooey bars. Or check out key lime gooey bars, Strawberry Gooey Butter Cake Bars, or Ooey Gooey Chocolate Chip Toffee Gooey Bars. 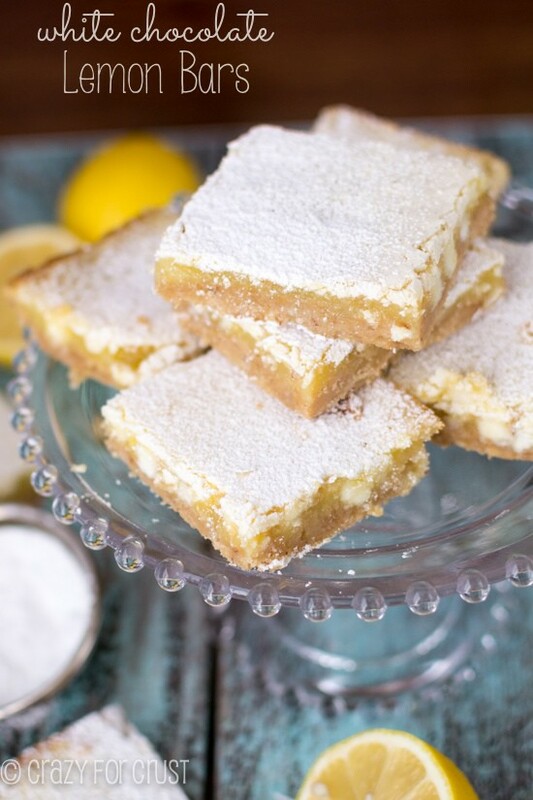 These Lemon Gooey Bars are SO EASY and so so good. Start with a cake mix and fill them with super lemony flavor. They're gooey and sweet and perfect lemon bars! 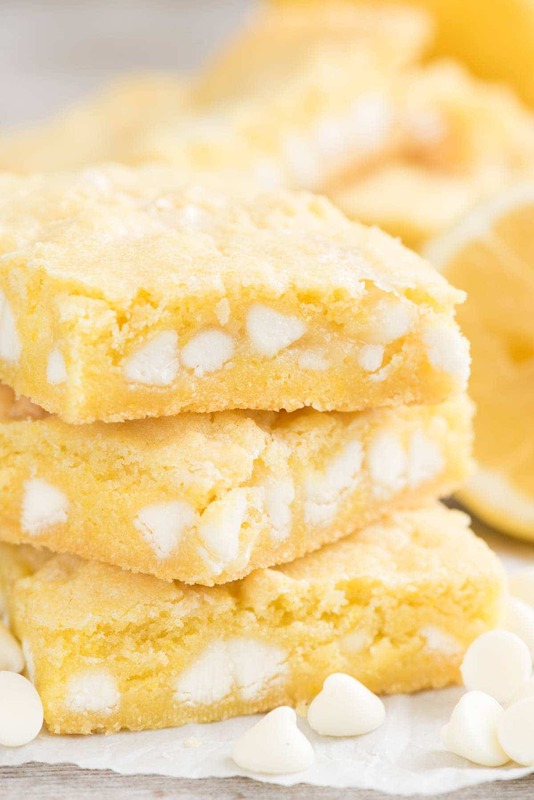 Lemon Gooey Bars - this EASY cake mix recipe uses lemon cake mix to form the bar that's filled with a gooey white chocolate filling! EVERYONE loves these! Preheat oven to 350F. Line a 9x9 baking pan with foil and spray with cooking spray. Mix butter with a mixer (hand or stand) until smooth. Mix in cake mix and egg; beat until combined. Note: if you use a hand mixer it will take a long time to come together. Just keep on mixing until you get a thick cookie dough. Press 2/3 of the cake mixture in the bottom of the prepared pan. Sprinkle white chocolate chips over the top and drizzle the sweetened condensed milk over the top of the chocolate. Break up the remaining dough and crumble it over the top of the bars. Press lightly to seal. Bake for 28-33 minutes, until slightly browned. Cool completely before cutting. Note: you can do this in a 9x13 pan by using the whole can (14 oz) of sweetened condensed milk and 2 cups of white chocolate chips, but the bars will be thinner. Baking time will also need to be adjusted. I doubled the recipe and used a 9X13 pan and chocolate cake mixes. A huge hit with the family. Now I’m going with the lemon. This is my new favorite bar recipe!!! Hi, do you think it would affect the cooking time or texture if I used a fruit in place of the white chocolate? I was thinking blueberries, or strawberries or raspberries. Thanks!